The proper place for nurturing young brains and developing good morals and academics is, of course, a school and the choice of school can influence the life of a child all through its adult life. 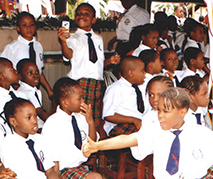 One school that stands head and shoulders above others in the region is Nkisi Regent School (GRA). This magnificent school is not only the best but is unique among the private schools because, apart from pursing rigorous and excellent academic programs, it has built a tradition of social consciousness offering waivers to single parents struggling to raise the children in addition to various scholarships and staff benefits. This unparalleled commitment by the proprietress, Rita Perlova Ochai has amongst other factors placed the school far above its competitors. Students of Nkisi Regent School have excelled in various competitions and external examinations recent examples being a recent Macmillan Publishers Mathematics Competition for Primary Schools in which we came first and the State’s chapter of OMEP Competition in Reading and Spelling which saw our pupils taking the first and second positions in all categories of the lower and upper primaries. Internal academic competitions are regularly conducted as part of a ‘star search program’ that has generated very healthy academic competition among the pupils with each striving to become the star-child of the week or month. Regular exhibitions also showcase the pupil’s creativity and ingenuity of the pupils. Our resolve as a school is to continue improving on our performances and facilities in our constant quest for perfection.